When product availability relies on knowing a combination of two attributes, such as a specific fabric and size, this is a must-have feature. With this feature, the choices available for the second attribute are dependent upon which first attribute is chosen. 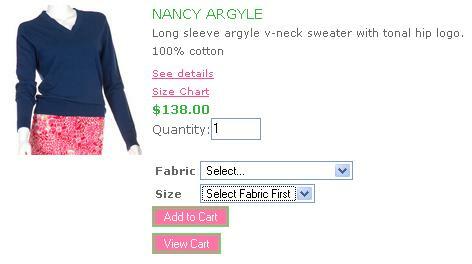 In the first example, the customer first chooses a fabric. 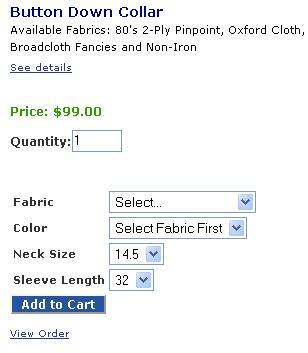 Size options then shown will be the sizes available in the chosen fabric. 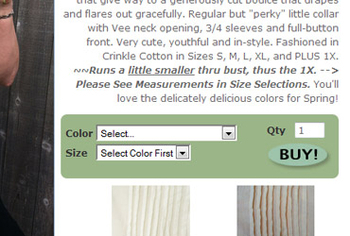 In this example, the colors available for these dress shirts are dependent upon which fabric the customer chooses. If the customer selects the Oxford Cloth fabric, they will be given a different selection of colors than if they choose Non-Iron fabric.